The recent development in PortaBilling100 architecture now enables performance savvy customers to have their database on a dedicated server. This distributed architecture employs the capacity of a dedicated server to run resource intensive tasks such as statistics queries and web interface requests and operations. 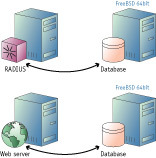 All database functions can now run on a separate server, which uses 64-bit FreeBSD version 7.0. In addition to many performance improvements (especially in the area of multi-processing) done in the operating system, 64-bit architecture allows to use more than 4GB of RAM in the server. This extra memory, used by MySQL for caching, drastically reduces the execution time for SQL queries. So overall this greatly enhances the call processing capacity of your PortaBilling100 Master server, the performance improvement for some complex systems and sophisticated businesses can be up to 200%. PortaOne customers can also use a dedicated 64-bit database server to run the PortaBilling100 slave database, this provides more performance capacity on your slave server for web requests or XML API and reduces time for SQL queries execution, resulting in faster web GUI for your administrators and end-users. The 64-bit database servers can be part of your existing PortaBilling100 system and does not require an additional license. A separate PortaCare contract is required to cover this server. Please contact your sales manager for a quote to order a separate database server.